U.S. Attorney General Eric Holder delivers the keynote address to the National Association of Attorneys General Traning and Research Arm's symposium on the reduction of crime at the The Westin Georgetown hotel May 5, 2014 in Washington, D.C. 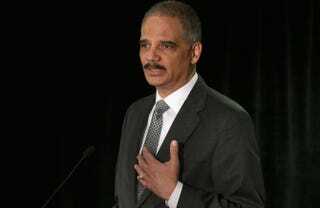 Subtle, everyday racism, especially within the criminal justice system, is far more harmful than racist outburst, U.S. Attorney General Eric Holder told graduates Saturday during a commencement address at Morgan State University in Baltimore, Md. He described racist outbursts, such as those by Los Angeles Clippers owner Donald Sterling and Nevada rancher Cliven Bundy, as “occasional, jarring reminders of discrimination—and the isolated, repugnant, racist views—that in some places have yet to be overcome,” but hardly represent the depth of the problem. He also discussed the deleterious impact of structural racism on African-American men and women, especially within the criminal justice system. Read the transcript at the Washington Post.